By now you have learnt to relax and focus in meditation. You have also learnt how to focus on each aspect of a meditation object. And you heave learnt how to find pleasant, neutral and unpleasant feelings associated with those aspects. In doing this, you are ready to use pain itself as a focus of meditation. Don’t worry if you haven’t been able to do this. You may just need more practice. There are also many other meditation methods, any one of which may help you. In the coming months I will try to find these and add them to the “Migraine” page I will add to this blog. Please look out for the new tab soon. If you have been able to find the pleasant, neutral and unpleasant aspects in meditation focuses, we can continue. To begin with, I suggest focussing on milder pain like a mild headache. When doing this, you are looking for aspects of the pain that are not unpleasant. This may seem strange at first, since you may be used to seeing pain as wholly unpleasant. But my own experience shows me that this is not so. I have not yet found any meditation focus that doesn’t have a range of aspects. Even migraine pain I have found to have neutral aspects. For me, I found a cold sensation that was not unpleasant. The exact aspect may be different for you, and may be different for each kind of pain. But in each case, you simply apply this meditation method to find a neutral aspect. As before, this may take time and practice. If you eventually decide you cannot find a neutral aspect and focus on it, then you may still find other forms of meditation helpful. If you can practise the technique of discarding pain and focussing on a neutral aspect, this will help you manage pain. You can also use this method to manage other unpleasant experiences. As you develop a habit of focussed meditation, recognising pleasant, neutral and unpleasant aspects, and focussing on chosen aspects, you take control over your experiences. There’s nothing mystical or “new age” here. You’re simply finding out how your mind works and using this to take control of unpleasant experiences. If you do find these methods useful, please let others know so they can benefit too. I would also like to hear from you if this has helped, or if other forms of meditation have helped you manage pain. I can then include these. Last week we began by learning and practising the simple “counting the breaths” method of meditation. Once you are used to doing this we can move onto using a “focus of meditation” other than breathing. There’s nothing essentially new here: We’re just moving from breathing as the focus, to something else. I’m going to suggest using this image of a rose. But you can use pretty much anything as a meditation focus. I have chosen a rose at it is likely to be familiar and unthreatening to you. 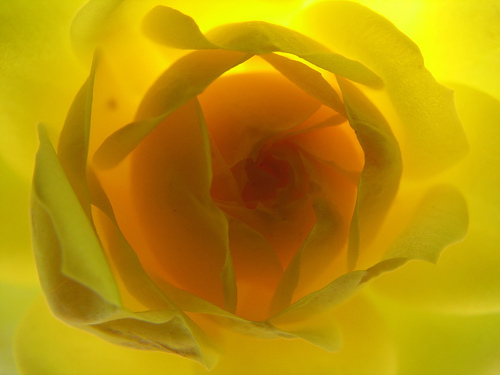 In this exercise, I want to try to teach you to break the rose apart in your mind while meditating. You can use the image of the rose itself or if you can, picture it clearly use its image in your mind’s eye. As you focus on the rose, begin with the image as a whole. You may notice its soft, yellow hue. Or you may notice more its soft texture. It doesn’t matter what as the experience is your own. Take some time to drink in the image. Now, I want you to move in and focus on single aspects of the image. You may notice the gradation from orange to green as you go from the centre to the edge. Or you may notice the change from distinct to soft texture. Again, it doesn’t matter what. What you notice is that the rose is made up of pieces. It has different hues, different brightnesses, different shapes and different textures. You may notice associations come up as time goes by. A colour may remind you of something else. You may remember a time as a child in your grandmother’s garden. Or you may think of a friend’s dress colour. Again, it doesn’t matter what. Acknowledge the association and return to the image. Because of the subject, most of the aspects may feel pleasant or at least not unpleasant. They have pleasant or neutral feelings associated with them. With each aspect as you change focus and associations pop into your mind, take a moment to explore the feeling. It is possible that an unpleasant feeling arises at some point. For this exercise, though not necessary, it is positive. At first it may be surprising that a pleasant image can have an unpleasant aspect. But this is true of many possible meditation focuses. They each may produce pleasant, neutral and unpleasant feelings. Each aspect of a focus may have an associated pleasant, neutral or unpleasant feeling. It is the realisation of this that is the important part of this exercise. You should now find other meditation objects to use as focuses. They don’t have to be visual images or things. Music or other sounds can serve as focuses. Textures can do so too. What I suggest you do is experiment for a few days or weeks with a range of different focuses. In each meditation, be aware of the aspects – the pieces – that make up the focus. Music can have different instruments, as well as changing pitch and loudness. A texture can have imperfections. And with each aspect, be aware of any pleasant, neutral or unpleasant feeling that arises. Don’t be scared to try a mildly unpleasant focus, like the white noise from an untuned radio, or a rough texture. Finding neutral or even pleasant feelings hidden within is a key part of meditating away pain we will come to in part three. In this way, you will get used to finding the aspects that make up meditation focuses. And you will get used to finding the pleasant, neutral and unpleasant feelings that are associated with those aspects. Today I want to start a three part Saturday Series to go with the last one on migraines. In this series, I will try to teach you basic meditation. The aim is to finish with my own meditation method to manage migraine pain. You should be able to use this method with other forms of acute pain – pain that goes away. I haven’t tried it on pain that stays – chronic pain. If anyone does find it useful, or not, for chronic pain please let me know. Before we start one word of caution. Although I draw on Buddhist meditation, it is not my aim to teach Buddhist meditation. To learn this you should find an ordained, qualified teacher. You do not need to be a Buddhist or learn other forms of meditation! Anyone may follow the method I will teach to manage pain. You can also apply the method to coping with other things you may dislike, like noise and other distractions. You may, though, like to know the origin of the “counting the breaths” and “pleasant, neutral, and unpleasant” aspects. I give the references at the end of this post. If you are interested in Buddhist meditation, these books are a great place to start. Finally, I have heard back from others who I have talked to. They suggest that pretty much any form of meditation can relieve pain. So if my method does not work for you, you may still want to try other ones. Meditation is a method to relax the mind and body while sharpening mental focus. Relaxation itself may help with pain management. The mental focus will help when we come to parts two and three. The most basic form of meditation is simple. Anyone can learn to do it. But in order to learn to meditate, you will need a quiet, comfortable space free from disturbances. If you have others around you, you will need to make sure they will not disturb you. Later on, as you go along, this will be less essential. You may also need pain-free time in which to start to learn meditation. Most teachers recommend some form of Eastern sitting posture. But for our purpose this is not necessary. The most important thing is that you are comfortable and undisturbed. You can sit in a full-lotus position if that works for you. But sitting on a chair, or cross-legged or lying down will each do fine. You can close your eyes, or keep them open. But you are more likely to fall asleep if you close them! All forms of meditation start with the breath. This is because it is a simple process we all do. So to begin with, simply sit (or lie) and be aware of each breath. Let the breaths come naturally as they will. Simply be aware of breathing in, and then of breathing out. After a while you may notice the slight, natural pause after each breath in and each breath out. This forms the usual cycle of breathing: breathe in, pause, breathe out, and pause, and so on. Do not worry if thoughts stray into your head. This is normal even for seasoned meditators! Simply think “I acknowledge this thought”, and return to being aware of your breathing. Also, do not worry if sometimes you cannot relax. This too happens even to seasoned meditators! Just acknowledge whatever happens. The important thing with meditation here is to just sit (or lie) and be aware of your breathing. And so on until ten. When you reach ten, simply begin at one again. If you should find yourself distracted, again simply acknowledge the distraction and begin counting at one. This is the method of counting the breaths. You should start by practising this simple method for a few days or weeks. Once you get used to just sitting (or lying) and counting breaths, you can move on to part two. Don’t worry! This series will be here when you’re ready to return! Counting the breaths, from p. 35 of Zen Master Thich Nhat Hanh’s Breathe! You are alive. Pleasant, neutral, unpleasant aspects, from the Satipatthana Sutta, from p. 20 of Zen Master Thich Nhat Hanh’s Transformation and Healing. Nhat Hanh, Thich. (1990). Breathe! You are Alive: On the Full Awareness of Breathing. Rider. Nhat Hanh, Thich. (2006). Transformation and Healing: Sutra on the Four Establishments of Mindfulness. Parallax Press.